CONVERGE Studio has powerful native tools to create, manipulate, and fix geometries to give you the error-free surface that you need for a CONVERGE simulation. To expand our capabilities, we have partnered with Polygonica* and Sculptor* to integrate additional toolkits in CONVERGE Studio. These tools expedite the geometry cleanup process and streamline the pre-processing workflow. While small CONVERGE CFD simulations can be executed in serial on a local machine in a reasonable amount of time, for larger simulations, a cluster of servers run in parallel is more efficient. We know that it’s not easy to maintain your own server, and for that reason we’ve partnered with cloud providers so that you can run CONVERGE on a pay-per-use basis. CONVERGE and GT-SUITE offer streamlined integration to allow users of either program to leverage the power of both programs. 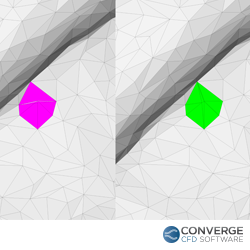 GT-SUITE users have access to CONVERGE Lite, which is a reduced version of CONVERGE that includes CONVERGE’s powerful and accurate 3D flow solver that can simulate complex geometries with no user meshing. CONVERGE Lite has an easy-to-use interface to rapidly set up simulations and perform parametric studies by creating multiple cases at a time. 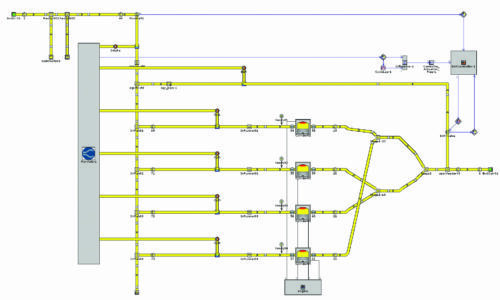 CONVERGE users who also have a GT-SUITE license can take advantage of CONVERGE’s detailed chemistry solver, multiphase flow modeling, and other powerful features while performing advanced CONVERGE + GT-SUITE coupled simulations. Coupling applications include engine cylinder coupling, exhaust aftertreatment coupling, and fluid-structure interaction coupling. After your simulation is finished, you need a way to visualize your results. CONVERGE’s post_convert tool easily converts individual cell data to a variety of post-processing formats, including EnSight, FieldView, ParaView, and Tecplot. *A separate license may be required.